Photo by Melissa Emerson via the Carroll County Sheriff’s Office Facebook page. 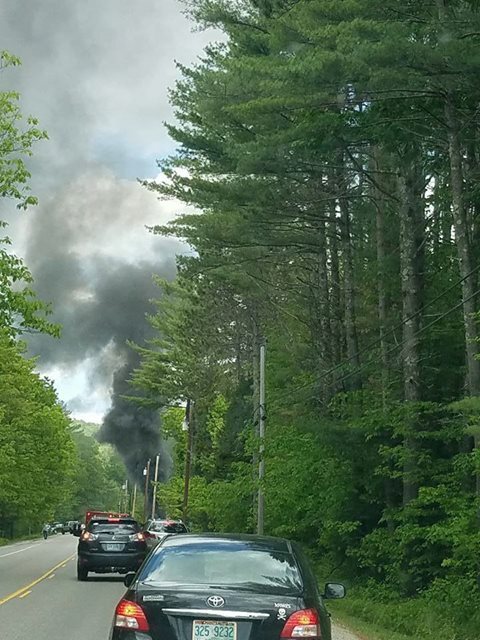 Albany, NH – A truck caught fire on Route 16 in Albany Sunday. According to the Conway Fire Department at 1:38 in the afternoon, crews were called to Route 16 just north of Monkey Trunks where a 2001 Chevy 1500 that had caught fire on. The owner of the vehicle told authorities that the truck caught fire and he attempted to put it out with 4 extinguishers to no avail. He then moved the vehicle away from his garage and it was left under the power lines off the side of the road. Luckily the wires were only slightly damaged. Fire crews were able to quickly extinguish the flames and clear the scene by 2:15pm. The North Bound Lane of Route 16 was closed while crews worked on the fire. The driver of the vehicle was evaluated by EMS crews for smoke and dry chemical exposure.